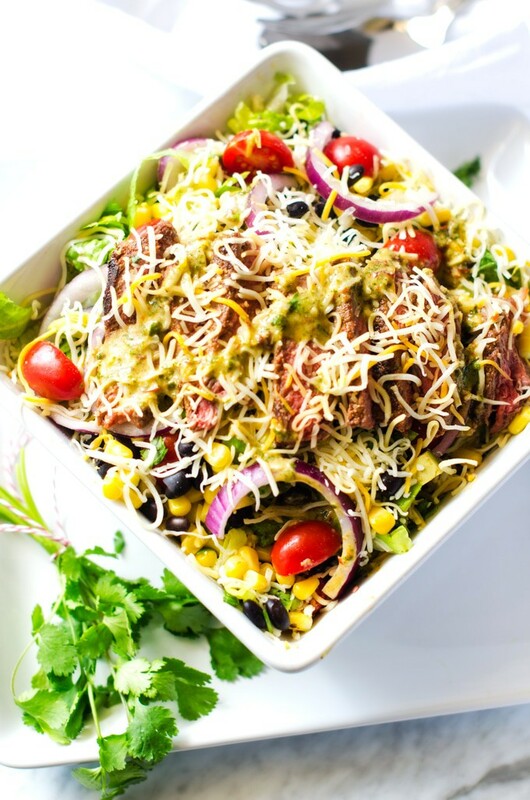 This Cheesy Mexican Steak Salad with Chipotle Lime Dressing is so easy to make and packed with flavor. The perfect Mexican Salad for a light dinner. When I was in college, we would go to this Mexican restaurant where I would almost always order a salad. Since I love all kinds of Mexican food, sticking with the same dish was unusual for me. I fell in love with the way they tossed the salad, added steak or chicken to the top and then added another sprinkling of a blend of cheeses. The cheese would always melt ever so slightly and create the most creamy salad that always seemed so decadent. I haven’t been to that restaurant in more than 20 years, but I’ve never forgotten the salad. 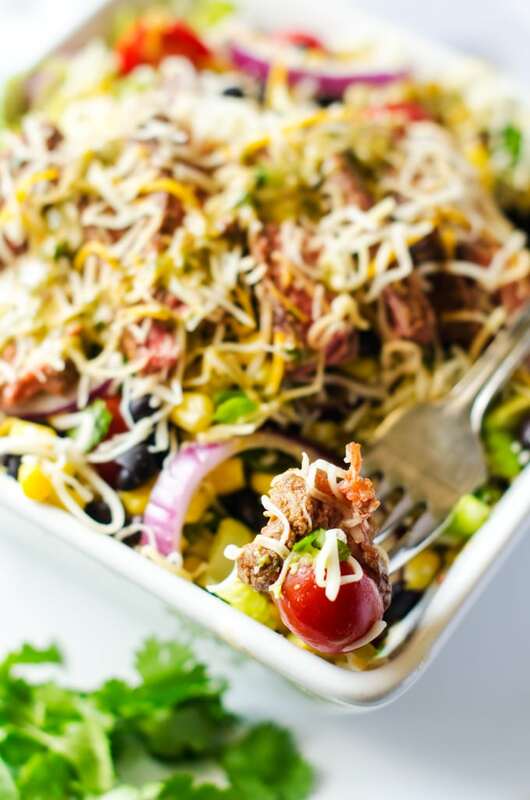 Today, I’m bringing you a riff on the salad I loved so long ago, made with Sargento® Fine Cut Shredded 4 Cheese Mexican Blend. 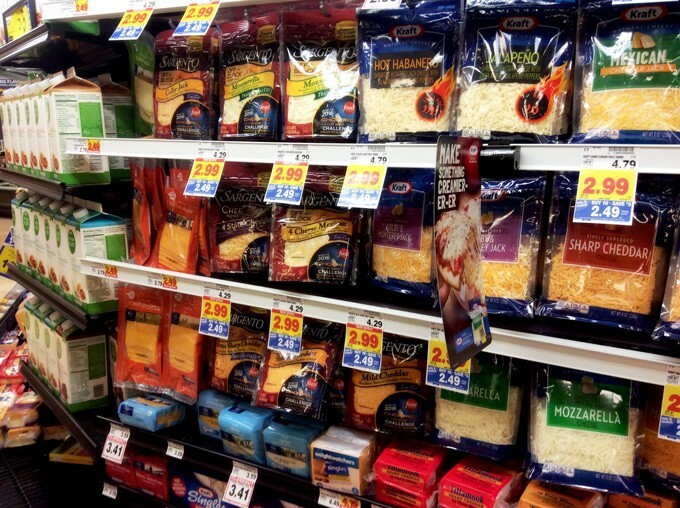 I love the off-the-block freshness of the cheese blend, which works just as well on a salad or melted into your quesadillas. Freshness makes such a difference in your final dish! 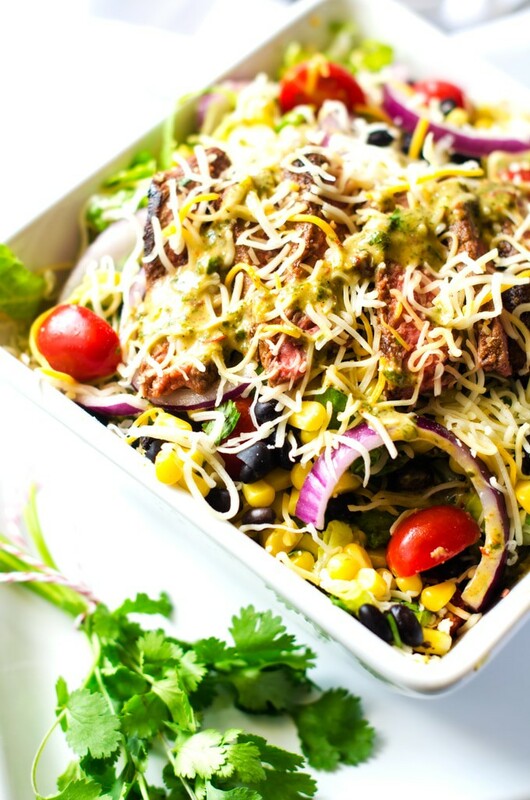 I have combined the cheesy goodness with seasoned grilled steak, black beans, corn, tomatoes, red onion and avocado and topped it off with a spicy-sweet Chipotle Lime dressing. 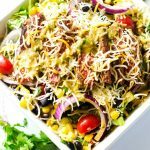 I think you will love this Cheesy Mexican Steak Salad with Chipotle Lime Dressing as much as I do. It is a meal that is perfect for easy entertaining or your next grill out! Mix garlic powder, chili powder and sea salt in a small bowl. Sprinkle over steak and allow to sit at room temperature for 30 minutes. Heat a grill pan to medium high heat. Meanwhile, make dressing by combining lime juice, olive oil, chipotle chile, garlic, cilantro, honey, cumin and sea salt in a blender. Process until smooth. In a large bowl combine romaine, all but 1/4 cup of the Sargento® Fine Cut Shredded 4 Cheese Mexican, black beans, onion, corn and tomatoes. Grill steak to desired doneness. Remove from heat and allow to sit for 15 minutes. Slice. Toss salad with desired amount of dressing. 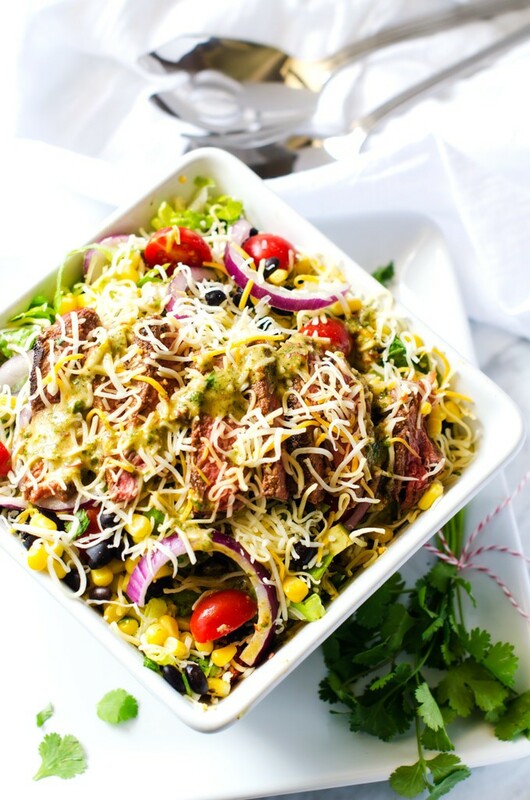 Top with steak, avocado and remaining Sargento® Fine Cut Shredded 4 Cheese Mexican. This is a great salad for dinner!